The periodical press claimed to civilize Peru. The first, official news periodical, Gazeta de Lima, described itself as something that quickly disseminated “a brief accounting of occurrences.” Then, in less than two centuries the literary magazine, Prisma, appeared. On the front cover of the September 1906 issue is a photograph depicting the civilizing power the press could have—two boys from among an aristocratic elite in Peru are attired in velvet suits with lace collars and leather shoes reading an issue of Prisma. It seemed that the periodical press accomplished what it claimed to do. Yet, at the same time, other periodicals argued that Peru was the exact opposite—uncivilized. This became the subject of articles filling the pages of periodical after periodical. What exactly did it mean to be civilized? Moving from being a source of general news to a resource that generated thought, discussion, and public discourse, Peruvian periodical literature—newspapers, magazines, circulars, and other similar types of imprints—was used to show how Peru could become a civilized nation. This development of the periodical press in Peru is examined in Special Collections’ current exhibit, In a Civilized Nation: Newspapers, Magazines, and the Print Revolution in Nineteenth-Century Peru curated by Erika Hosselkus (Curator of Latin American Collections). Featured in this exhibit are materials from Rare Books and Special Collections’ José E. Durand Peruvian History Collection. Durand (1925-90), a native of Lima Peru, professor of Spanish literature, writer, and bibliophile, amassed an impressive research library. His library reconstructed the type of library the important 16th-century Peruvian writer Garcilaso Inca de la Vega possessed. In addition, Durand built a significant collection of early printed books and literary, historical, economic, and ecclesiastical manuscripts. Distinguishing this collection are numerous unique items, including the only existing copy of a 17th-century play, Tragicomedia de la Ystoria de Joseph, and a dialogue between two friends discussing conditions in colonial Peru. Another important part of the Durand collection is his personal collection of rare literary and historical journals pertaining to late Colonial and 19th-century Peru. Noteworthy is Peru’s first newspaper, Gazeta de Lima—more than fifteen of the Gazeta issues in the Durand collection are held only at Notre Dame. Selections of these materials document both the history of periodical literature in Peru and the wealth of research opportunities in the Durand collection. Hard-to-find circulars from the Independence period provide a window into political interests of the time while rare cancioneros (popular song and verse imprints) featuring polkas, waltzes, and Latin American music show how cultures were intersecting and what people were interested in buying. Lithographs in periodicals and books show the advances in technology beginning in the 1860s. The development in types of illustrations used in official periodicals—lithographs, engravings of city scenes, portraits of important Peruvian leaders and other figures—culminates around the turn of the century with the introduction of color lithographs and photographs. In a Civilized Nation features only a small portion of the materials held in the José E. Durand Peruvian History Collection. Erika lamented how difficult it was to select materials because there were so many items that could and should be on display. Her dilemma speaks to the breadth of this collection. Erika would also like to extend special appreciation to Sara Weber for her visual design work. In a Civilized Nation runs through August 2018. The exhibit is free and open to the public, Monday to Friday, 9am to 5pm. An expanded digital exhibit is forthcoming in late spring. Weekly exhibit tours are offered Tuesdays at noon through the end of April. Special tours can also be arranged for classes or other visiting groups, including K-12 audiences. To schedule a group tour, please contact Erika Hosselkus. In Se questo è un uomo (If This is a Man), Primo Levi articulates that all experience informs our thinking and understanding about what it means to be human. Levi’s own experience as a chemist and a human subjected to extreme suffering in Auschwitz resonates throughout his works on display here. Elements of Humanity: Primo Levi and the Evolution of Italian Postwar Culture, the current exhibit in Special Collections to commemorate the 30th anniversary of Levi’s death, is curated by Tracy Bergstrom with assistance from Vittorio Montemaggi (Lecturer, Religion and the Arts, King’s College London) and Valentina Geri (PhD candidate, Italian). 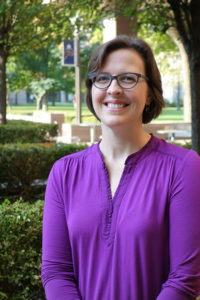 Tracy is the Program Director for the Specialized Collection Services Program and the curator of the Zahm Dante and early Italian imprints collection at Notre Dame. She earned a Bachelor of Arts in Italian Studies and Art History from Smith College, a Master of Arts in Archaeological Studies from Yale University, and a Master of Library Science from Southern Connecticut State University. The exhibit invites viewers to engage with the works on display to explore Levi’s life and work. Tracing the development of Levi’s writings and their reception, Elements of Humanity demonstrates how they are interconnected. The books on display challenge viewers to reflect on what they see, on how art and history are related, on the connections between truth and fiction, on the relationship between scientific and humanistic knowledge. Elucidating this synthesis is Levi’s Il sistema periodico (The Periodic Table). His scientific knowledge and analysis are woven with his literary skills, illuminating his experiences—personal, social, and political. In the series of short stories, each bears the name of an element which Levi uses as a metaphor for particular experiences from his life. On display, set in front of stunning images created by the Japanese artist, Yosuke Taki, is the opening of “Carbon” in which Levi traces the journey of a single carbon atom across time and space, a journey reflecting the experiences of the writer himself. Most of the books in this exhibit are part of the Primo Levi Collection in Special Collections. Beginning in 2009, Hesburgh Libraries and Italian Studies partnered to develop this as a new collection that deepened the Italian holdings’ reach to include contemporary Italian literature. At the launch for this collection in Fall 2011, Father Hesburgh spoke about the importance of Notre Dame holding such a collection to use for teaching and research. The Levi Collection now includes all first editions of Levi’s works printed in Italy during his lifetime and of notable translations, especially in German and English, and adaptations that document Levi’s importance outside of Italy. The Primo Levi Collection in addition to the Zahm Dante Collection and the other Italian literature collections held by the Libraries continue to support teaching and research for the campus and international visitors, and it also provides an invaluable resource for a new PhD program in Italian. These collections are heavily used by undergraduates, graduate students, and faculty at Notre Dame and by visiting scholars. Over the past few years, Italian Studies has made increasing use of these materials for the seminars it holds related to Italian Holocaust Studies. Of note, in 2012, Robert Gordon (Serena Professor of Italian at the University of Cambridge) examined the collection, gave a talk titled “Outrageous Fortune: Luck and the Holocaust,” and met with graduate students. Works from the Italian literature collections have been exhibited on numerous occasions. Between 2008 and 2011, rotating exhibit cases featured topical exhibits: “Petrarch in 16th-Century Translation” and “Dante for Children.” A spotlight exhibit, “Plumb Crazy: Dante and Music,” ran October 3-28, 2016. “The Sixth Centenary Festival of Dante” was on display in Fall 2015, displaying works to commemorate the 600th anniversary in 1865 of Dante’s birth. Italian collections were also featured in All Roads Lead to Rome: New Acquisitions Relating to the Eternal City (Fall 2011). Elements of Humanity opened on September 5, 2017 with remarks by Tracy Bergstrom, Vittorio Montemaggi, and Valentina Geri. The exhibit will remain on display through December 15, 2017. The exhibit is free and open to the public, Monday – Friday, 9am – 5pm. Tours for classes or other groups, including K-12 requests, are available. Please contact Tracy Bergstrom at tbergstr@nd.edu or (574) 632-1763 to schedule a class or tour. When people enter the Hesburgh Library, they may walk right by the Rare Books and Special Collections department without glancing inside. They may have never heard of this department or do not know what is inside. This department is what I tell people is the “hidden gem” of the library. The people who do walk through the large doors enter what I think is one of the most beautiful rooms on campus. They stand in a room of large wooden shelves and glass cases that are full of histories and stories. The weathered books along the wall invite visitors to think about time. People who find their way to Rare Books will be amazed at the extensive collections as well as the knowledge and dedication of the excellent staff. There are several students who work in this department during the summer as well as the school year. They have unique backgrounds, jobs, and perspectives about this lovely department. 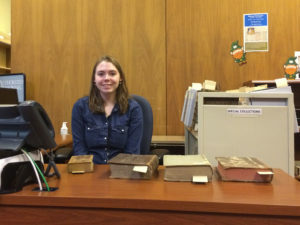 My name is Shannon Gaylord and I have been working at Rare Books and Special Collections for the last four years. I just recently graduated from Notre Dame where I majored in Psychology and minored in Education, Schooling, and Society. I am a student worker in the department, but I like to call myself the “Executive Book Manager” because it is a fun title and I primarily work directly with the books in the various collections. I have done a large variety of tasks during my time here such as assisting with stacks management which includes reshelving books, pulling materials, and shifting collections. I enjoy getting the chance to come in contact with so many ancient texts in all of the work that I do. I have worked with many of the department’s materials such as the American Colonial Currency collection and the Lohmann collection. I have assisted with the preparations for many of the classes and lectures that occur in the department. I also work at the department’s front desk where I assist patrons with materials and book scans as well as monitor those who are using the reading room. While the collections at Rare Books are wonderful, my favorite part about working here is the group of people that make up this department. These people work together to create an incredibly welcoming environment that promotes curiosity and learning. They have so much knowledge that they willingly share with patrons and students. I am very thankful to have had a chance to work alongside and learn from each of these staff members over the last couple of years. I find it hard to believe that I had never heard about Rare Books until I walked into the department for a job interview during my freshmen year. Now when I walk into the department, I feel at home because of the people here who welcomed me into the Rare Books family. I am so happy that I could continue working at Rare Books this summer and look forward to using the skills and knowledge from this job in the future. This fall, I will be attending the University of North Carolina at Chapel Hill for my Masters in Social Work. This summer, I’ve also had the pleasure to work with RBSC’s crew of summer student employees. Most of them are either undergraduate or graduate students at Notre Dame, but there are a few visitors. I’ve talked to them about what the work they are doing in RBSC. Here’s a look at all the things happening this summer. Augusto Rocha Ramirez is a PhD candidate in History. He is currently working at Rare Books under the supervision of Erika Hosselkus, Curator of Latin American collections. He is arranging materials into series and ensuring that they are filed properly for future retrieval. These materials include Uruguayan political ephemera from the late 19th and early 20th centuries. Sara Quashnie graduated from Notre Dame in 2015 with a BA in History. She is back this summer completing a practicum for her Master’s in Library and Information Science from the University of Illinois, Urbana-Champaign. Though she is not officially on RBSC’s payroll, she is doing some work in the department. She co-curated a spotlight exhibit, “War as Child’s Play: German Children’s Literature from the World Wars,” is describing a collection of original drawings tipped into an album created by British civilians held prisoner in a German internment camp during the First World War and creating a finding aid for it, and will be authoring a blog post about that collection. Sae Rome Choi, a junior Chemical Engineering major, has worked for the department for three years. She assists one of our rare book catalogers, Bo Karol, processing rare and medium rare books. Sae Rome adds copy specific notes to the bibliographic records and also prints the flags for the books so that they can be shelved in their proper locations. Thank you for taking a look at the Rare Books and Special Collections department through the eyes of its student workers. If you have not visited this department yet, we encourage you to stop by! This “hidden gem” is waiting just behind the doors. Special Collections thanks our six graduating seniors for the work they have done for us processing collections, assisting visitors, reshelving books, shifting collections, scanning documents, and assisting our rare book catalogers. The two fencers in Domenico Angelo’s L’Ecole des armes saluted, closing Ingenious Exercises, and welcomed Matthew Carey and the transatlantic story narrated in “Preserving the Steadfastness of Your Faith”: Catholics in the Early American Republic. 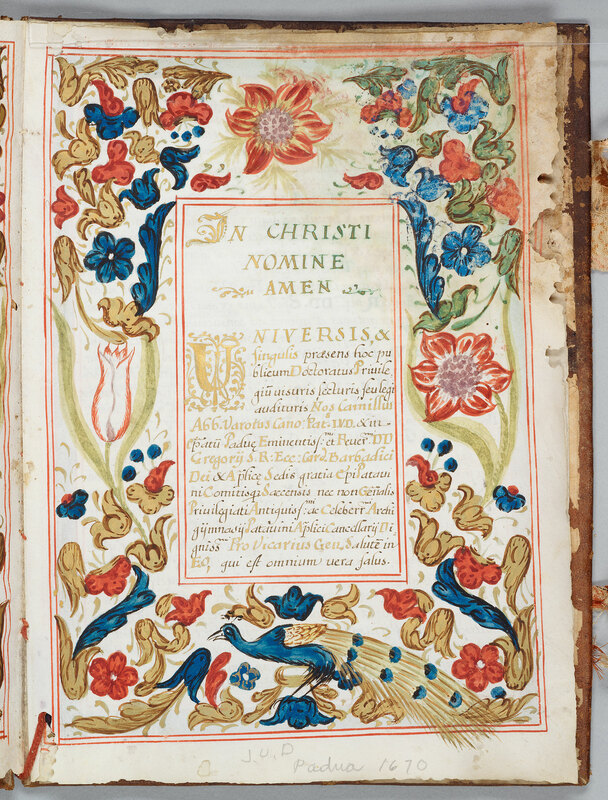 The new Spring exhibit features printed books, newspapers, and pamphlets that document the flow of ideas about Catholicism between the United States and Europe. Bringing coherence to the flurry of ideas represented by the diverse artifacts on display are Rachel Bohlmann and Jean McManus. 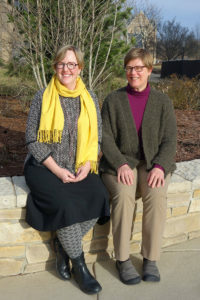 Rachel and Jean (U.S. History & American Studies librarian and Catholic Studies librarian, respectively) teamed up to explore what our collections held on Catholic America. As they began this seemingly daunting task, they soon realized they first needed to address what exactly Catholic literature in America was and what it meant to be a Catholic in America. For Jean, these questions stemmed from Notre Dame’s 2014 acquisition of the The Holy Bible printed in 1790 in Philadelphia by Matthew Carey, more commonly referred to here [on campus? at Notre Dame?] as the Badin Bible. This bible is a copy of the first authorized Catholic bible in English and was translated from the Latin Vulgate in 1568 by members of the English College, a Catholic seminary in Douai in northern France. Its publisher, Matthew Carey, was an Irish Catholic who emigrated to Philadelphia. Known for standing against the British Parliament in defense of Irish nationalism and Catholic emancipation, Carey became a successful Catholic publisher in the U.S. Jean questioned what it meant to be a publisher who was Catholic and, more broadly, what it meant to be Catholic in America. For Rachel, a common theme that emerged among these sources was their transatlantic identity. As she and Jean chose particular stories to tell, each story connected to Britain or Europe, often in multiple ways. These ties could be in the form of refugees as in the case of Stephen Badin who fled Revolutionary France or ideas such as the pamphlets that circulated between the US, Europe, and Britain and, sometimes, the ties involved both refugees and ideas. Turning to the principal Catholic Studies reference book, Wilfrid Parson’s Early Catholic Americana, they compared Special Collections’ holdings to the works listed in Parson and selected most of the items on exhibit based upon their inclusion in this work. Their selections represent American Catholicism defined by early printed works that include books, pamphlets, newspapers, official reports, and maps. What emerges is a six-chapter, multinational story beginning in the 1780s and running through the 1840s of early Catholicism in America and its ties to European Catholicism. The exhibit runs January 16 – August 11, 2017. Weekly tours led by Rachel and Jean on Thursdays begin at 12:30 and will be offered through the end of March. Class tour are also available. Please contact Rachel to schedule a tour. Historian and former Cushwa Center Fellow Catherine O’Donnell’s talk explores Elizabeth Ann Seton’s spiritual journey as it intersected with Catholic history during the early American Republic. O’Donnell is the author of “John Carroll and the Origins of an American Catholic Church, 1783-1815” and Men of Letters in the Early Republic: Cultivating Forums of Citizenship (2008). She is currently completing her second book, Elizabeth Seton: a Life. This talk explores the ways in which new digital humanities projects, such as the Jesuit Libraries Provenance Project, have allowed us to recover the central importance of print to American Catholics. Roberts is also the author of Evangelical Gotham: Religion and the Making of New York City, 1783-1860 (2016). Summer is always an exciting time for the department. This is when we take advantage of hiring students who have more time in their schedules to work on some of our larger projects and to assist with other departmental needs. When RBSC hires students, our intent is not just to have them do work for us. We also introduce them to our world—manuscripts, rare books, maps, broadsides, prints, posters, ephemera—teaching them skills that often complement their studies and that, in some instances, provide the foundation for better understanding the materials they are using in their own research. Sometimes we are even delighted to hear that spending the summer working in RSBC inspired them to consider either doing research based on special collections or pursuing a career in our profession. Our students’ work, though, often goes unnoticed because it is hidden in the processed collection, the online finding aid, the reorganized collections. To highlight our students’ efforts to make these materials accessible to students, faculty, and visiting researchers, we’d like to feature them in this week’s post. I assisted George Rugg with creating finding aids for two collections of letters. The first is for letters received by Jack Pfefer, a Russian emigre to the U.S. who, from the 1930s to the 1960s worked as “New York’s foremost wrestling impressario,” managing and promoting professional wrestlers. He helped transition wrestling from something regarded as a sport (like boxing) to the more theatrical entertainment it has become today. The second finding aid is for a collection of American Civil War letters written by two brothers from North Carolina, William Lafayette Barrier and Rufus A. Barrier, to their father, Mathias Barrier, while they served in the Confederate Army. William Lafayette served in the 1st North Carolina Cavalry and Rufus served in the 8th North Carolina Infantry. Only Rufus survived the war. This summer gave me an appreciation for the laborious process of organizing and making available special collections like these—how all this hard work, done incrementally and by many people over many years, ends up producing a quality database that will, hopefully, be used by researchers to come. I worked with Julie Tanaka to process two collections; one of French manuscripts and printed documents related to funerary practices and laws, the other of telegrams from the Havas French Press. For both, I organized and described the materials in the collections and then drafted EADs for them. When I started this summer, I had never worked on archival collections, so I had to learn the basics of organizing and describing a collection. After ten weeks or so, I learned quite a bit about thinking like an archivist and about inhumation practices in Napoleonic-era France. Halfway through the summer’s work, I could already tell that few things get me as excited as making sense of old documents and seeing a story unfold from otherwise inert tree pulp. I guess that confirms to me that I am an aspirant researcher, although I know I still have long strides to make in terms of developing stamina (sitting for long hours is not my favorite) and in terms of sharpening my curiosity and intuitions. For one, I have yet to really build up the habit of taking nothing in a document for granted. But conversely, I now know experientially what it means to let primary sources enter into your imagination and breathe for themselves, tell their story. To illustrate what I mean, the turning point in my work this summer was when it finally struck me that the burial practices that Napoleon established in 1805-1806, of which I was holding some of the foundational documents, were effectively identical to those in place at my grandmother’s burial a year and a half ago in Paris. Research is me-search, as the saying goes, but I never expected archiving to be me-archiving. I worked on the Patrick McCabe papers. McCabe is a contemporary Irish author who is best known for his novels, The Butcher Boy and Breakfast on Pluto, both of which were made into films. Under the guidance of Aedin Clements, the Irish Librarian, I sorted through the many boxes of papers McCabe sent the University. Among others, there were drafts and fragments of plays, poems, short stories, novels, and screen plays of his many works, both published and unpublished, as well as financial information and business and personal correspondences. My summer in RBSC has provided valuable insight into the world of archiving. I began interning in RBSC because I am writing my thesis on the relationship between archiving and the creation and destruction of memory. By working in an archive, I learned that just as human memory can be selective, so can an archive’s memory. It is the duty of the archivist to provide as complete a picture as possible with the materials available. I loved working in RBSC, and I know that because of this experience, I am better equipped to understand the art of archiving. I assisted Dave Gura with reorganizing the collection of rare book vendors’ sales catalogs. This collection provides important documentation about book sales such as prices, provenance, vendors, and when a copy of a particular book was last on the market. 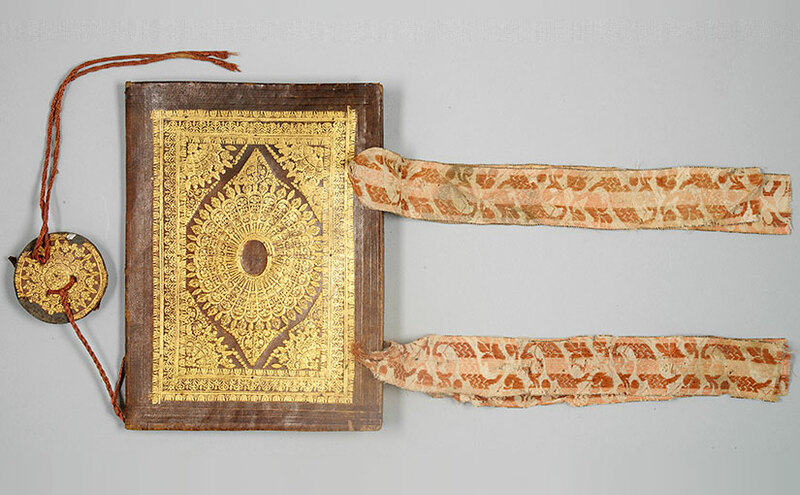 In many cases, the catalogs provide the only documentation of the locations rare manuscripts are held in private collections and that would otherwise be untraceable. I helped assess the collection. I then organized the remaining sales catalogs. In addition, I assisted Dave with copyediting the incipit indices (index of the beginning words or line of Latin texts) for his forthcoming descriptive catalog of medieval manuscripts held at Notre Dame and Saint Mary’s College. 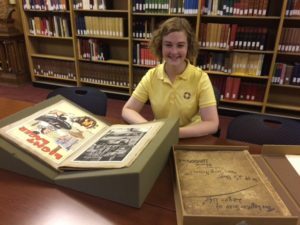 The behind-the-scenes work was only a part of my summer in Special Collections. I also staffed the front desk where I was the first point of contact for visitors. I answered numerous questions about the department and its collections, registered researchers, and set them up to use materials in the reading room. I worked with Ken Kinslow and Natasha Lyandres in Special Collections since November of 2015. This summer, I was able to continue some projects that I had started earlier. During the academic year I was able to work only for a couple of hours a week while this summer gave me the opportunity to concentrate on more comprehensive projects that will prove useful for my dissertation. In particular, I organized and described the papers of a notable Soviet dissident, Boris Tsukerman. These papers are of a great importance for scholars working within the field of human rights in modern Europe and Russia as they help to reveal the legalist dimension of the dissident movement at the time. Also I plan to work on the Tsukerman collection this fall, but this time for the purposes of my research paper. Outside of working on the Tsukerman Papers, I assisted with other minor projects. Specifically, I assisted in the cataloging efforts for the Natalia A. and Irina V. Roskina, the Eleonora P. Gomberg-Verzhbinskaia, and the Iiuliia Markovna Zhivova and Ivan Dmitrievich Rozhanskii papers. 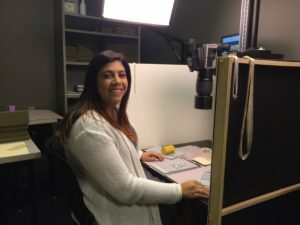 Work at the Special Collections this summer gave me a broader perspective of what I can do after completing my dissertation. Specifically, sorting and cataloguing Tsukerman Papers revealed how some very important dissidents are understudied and therefore generally unknown in the academic world. This persuades me that outside of working with already catalogued collections, I have to pursue opportunities to acquire new and unsorted papers and make them known to scholars of human rights and political dissidence. Elizabeth, home for the summer from the University of Saint Francis, in Fort Wayne, IN, worked with Sara Weber on a number of digital imaging projects. 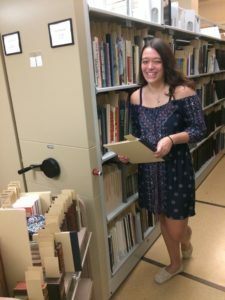 For a project that was begun during the school year, she finished organizing and foldering materials in a collection of baseball sheet music and locating records in WorldCat for the materials that had them. She entered this information into a Google doc so that this metadata could be imported when the digital collection is created in the fall, then scanned the pieces not in copyright. She also took digital photographs for other projects including the fall exhibit, Ingenious Exercises: Sports and the Printed Book in Early Modern Europe, 1500-1800, the forthcoming digital exhibits on basketball and the Durand collection, and also a project underway pertaining to a collection of medieval manuscript fragments. I enjoyed being able to work hands on with the rare books. I especially enjoyed the more decorative books and the ones with an abundance of old illustrations and prints. Hopefully I can incorporate what I’ve seen and worked with into my future work. 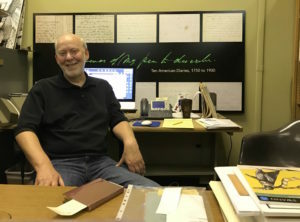 Dave Gura joined Rare Books and Special Collections in August 2010 as Curator of Ancient and Medieval Manuscripts. Trained in Greek and Latin with particular interests in textual criticism, Latin paleography, and manuscript studies, Dave earned his B.A., M.A., and Ph.D. from The Ohio State University. His doctoral research examined the transmission of the Roman poet Ovid in the Middle Ages and culminated in his dissertation, “A Critical Edition and Study of Arnulf of Orléans’s Philological Commentary to Ovid’s Metamorphoses,” under the supervision of Professor Frank T. Coulson. 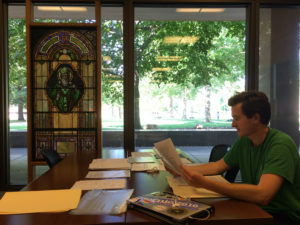 Since coming to Notre Dame, Dave has been engaged in numerous projects that have brought attention to the library’s Medieval manuscript collection. He co-curated an exhibit with his colleague, David Sullivan, titled Readers Writing Books: Annotation in Context, 1200-1600 in Spring 2012 that featured medieval annotations in printed texts. Then in Spring 2013, Dave curated his first full exhibit, Hour by Hour: Reconstructing a Medieval Breton Prayerbook, and a version of this was put on display at the Snite Museum at Notre Dame for the Medieval Academy of America annual meeting in Spring 2015. This exhibit featured a fifteenth-century Book of Hours from Brittany, France that had been cut apart so that individual leaves could be sold. In curating this exhibit, Dave aimed to reconstruct the entire manuscript, searching for the various leaves that had been sold, and to inform viewers about the practice of book breaking. Dave’s current exhibit features papal manuscripts, books, and other materials related to the Vatican. 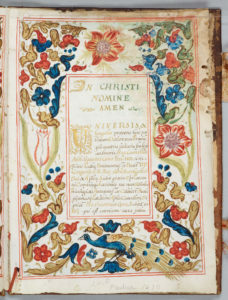 Vestigia Vaticana: An exhibition of papal manuscripts, books, and more in conjunction with the conference “The Promise of the Vatican Library” at the University of Notre Dame opened May 4, 2016, to coincide with the conference. In addition to highlighting the collection through exhibits, Dave uses the medieval manuscript collection to teach a variety of classes that range from individual tutorials on Western codicology to graduate courses on Latin paleography. Students get hands-on experience analyzing these manuscripts. They learn basic aspects of Western codicology—the study of books as physical objects—including how to read different styles of Latin handwriting, identify bindings, and estimate the period in which the text was written. Both his classes and exhibits reflect how Dave views his role as curator. He works with manuscripts in the RBSC collections, researching their provenance and content and using them to teach students, faculty, and the public. One of his main goals is to help undergraduates and graduate students develop the skills they need to conduct their own research with these types of materials. A consummate scholar, Dave has an active research agenda. He recently completed his book entitled A Descriptive Catalogue of the Medieval and Renaissance Manuscripts of the University of Notre Dame and Saint Mary’s College, which is forthcoming from the University of Notre Dame Press. Having finished installing his exhibit, he plans to resume research on a newly acquired fragment that is an unknown witness to a 13th-century French poem to Charlemagne’s mother. From the hours he spends examining 13th-century papal bulls to evaluate their legitimacy to his dream of acquiring a perfectly glossed, complete, 13th-century copy of Ovid’s Metamorphoses, Dave’s passion for what he does is quite apparent to all of us in Special Collections. 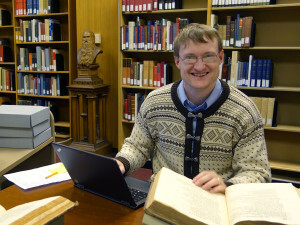 To keep up with his research on ND’s medieval collections, follow him on Twitter. Standing beside oversized reproductions of two issues of The Cork Examiner from May 8-9, 1916, Aedín Clements commented how delighted she is that Rare Books and Special Collections (RBSC) has such an extensive collection of historical newspapers from Ireland. She explained that these newspapers are important sources for understanding Irish society and, thus, must be preserved and made discoverable and freely accessible to researchers here and worldwide. This has become one of her many projects as Irish Studies librarian. Aedín, a native of Dublin, studied Irish literature, language, and folklore at University College Dublin from which she earned her bachelor’s and library degrees. She also earned a master’s degree in English literature from Western Michigan University. In 2005, Aedin joined the Library as Irish Studies librarian. 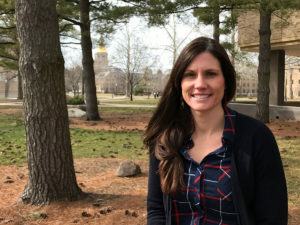 She was attracted to this job because of Hesburgh Library’s extensive 20th-century Irish language collection, one that covers a broad range of disciplines and includes children’s literature, Irish language and literature, traditional songs and ballads, and more. She admits a special place in her heart for the O’Neill Collection, which has a little something for everyone. In December 2015, Aedin also became Interim Head of the Area Studies and Global Affairs unit within the Hesburgh Libraries. 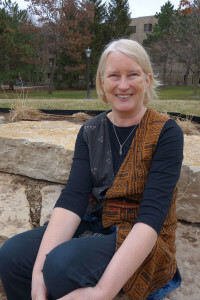 Her expertise and work in Irish Studies are evident in many ways including invitations to speak at conferences and events and the multiple exhibits she has curated for RBSC. Her scholarship and service to the profession have been recognized by Notre Dame: Aedín was awarded the 2013 Rev. 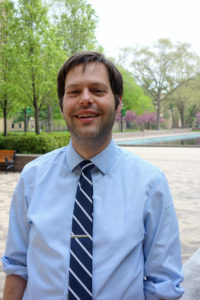 Paul J. Foik, C.S.C., Award by Hesburgh Libraries and was elected in September 2015 as a Faculty Fellow of the Nanovic Institute for European Studies. Aedín has a list of to-dos that is perpetually growing because she is always on the lookout for enhancing existing areas of collecting strengths—18th- and 19th-century literature and history—and keeping up with all of the new or evolving research interests of faculty and students on campus. She is always thinking about how to make Hesburgh’s collections more accessible and, equally important, how to educate people about these collections. Recently, she partnered with a newly established network of librarians, the Libraries and Archives Group of the American Conference for Irish Studies (ACIS), to develop innovative ways for better developing collections. The network will take up this very issue at the upcoming roundtable discussion during the ACIS conference at Notre Dame, March 30-April 3, 2016. After discovering that Hesburgh Libraries holds a wealth of sources documenting the Irish American perspective, Aedín developed an interest in Irish American history. When asked if there was a particular item that caught her attention, she smiled and said, “Yes, McGee’s Illustrated Weekly!” This was a newspaper founded by an American, James Redpath, who gave Americans a glimpse into Irish life, spattered with a bit of Irish and American humor, the latest fashion trends, and portraits of prominent Irishmen. Yet, Aedín’s love of the Irish language always draws her back. She is currently immersed in reading Visions of Ireland: Gael Linn’s Amharc Éireann Film Series, 1956-1964 by B. Mairéad Pratschke. Aedín can often be found digging through the Irish collections in RBSC. None of her colleagues is ever surprised when she comes skipping down the hall with the biggest smile you can imagine, as she did when she discovered that we have a large collection of yet-to-be processed historical Irish newspapers. It turned out that this is where she unearthed the copies of the Cork Examiner. Aedín’s wide-ranging knowledge of and curiosity about all things Irish can be seen in her current exhibit, Easter, 1916: The Irish Rebellion, which is on display in Rare Books Special Collections through April 28, 2016.